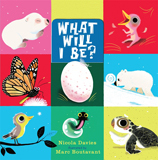 Talk, Talk, Squawk!, the newest book from superlative zoologist and children's book author Nicola Davies and equally matched illustrator Neal Layton, might just be their most fascinating yet. 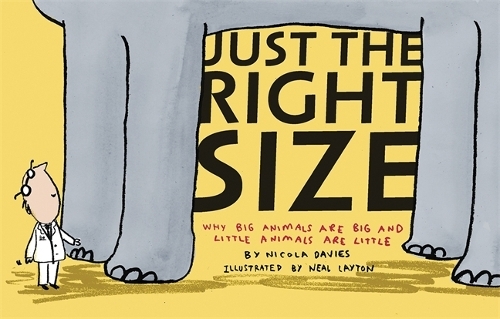 If you are already familiar with books by this dynamic duo, such as Just the Right Size, reviewed her, and others, then you know what a knack Davies has for presenting and writing about scientific information in ways that will appeal to kids almost as much as a bag of Halloween candy might. Subtitled, "A Human's Guide to Animal Communication," Talk, Talk, Squawk! 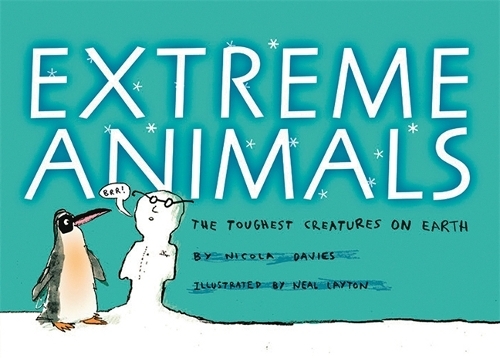 is not meant to create a generation of Dr Doolittles, but instead introduce readers to the verbal and non-verbal ways in which animals communicate with each other, starting on the title page, where an illustration shows a panda doing a handstand against a tree. A blurb tells the reader to turn to page 20 to find out why. It turns out that pandas have a scent gland under their tails that they use to mark their territory. They send an extra signal by doing a handstand while marking a tree, letting other pandas know that "The panda who left this message is very BIG indeed." Davies goes on to say that a stale smell shows that a "territory might not be very well patrolled and could be a good place to invade. So animals never miss a chance to scent-mark their territories, as anyone who has ever walked a dog knows." Aha! That explains why some days it seems to take an extra fifteen minutes to walk my dogs! 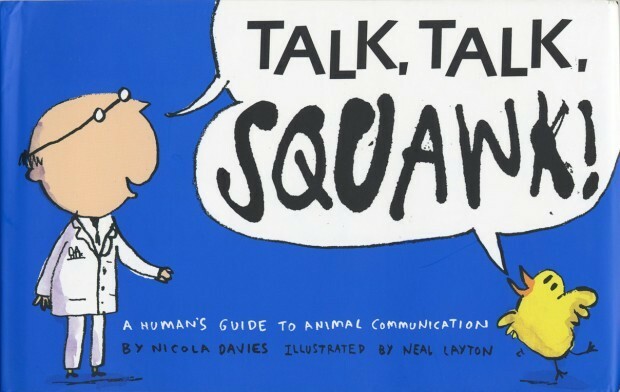 There are so many fascinating facts in Talk, Talk, Squawk! that I had a hard time choosing what not to share with you here. 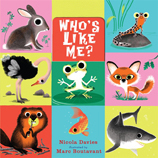 Davies organizes her book by showing how coloration, patterns and uniform appearance allow animals and insects to tell you who's on your team (and who isn't) as well as what jobs different creatures might perform. She moves on to smells and the ways that animals and insects use them to keep predators away, indicate family and mark territory. Desert iguanas, very small reptiles with a large territory, mark their border by "squeezing blobs of smell from a row of holes on the underside of each back leg. 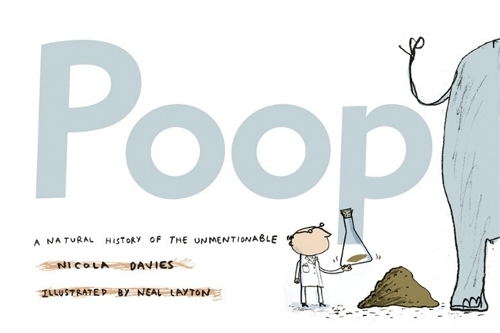 Each blob is coated with a waxy layer to keep the smell from escaping too quickly." Amazing! Davies moves on to animal sounds, noting that "smell just isn't enough to keep intruders at bay, and a stronger signal is needed." Sounds aren't only used for protective purposes, but also for mating, as noted on the page above. 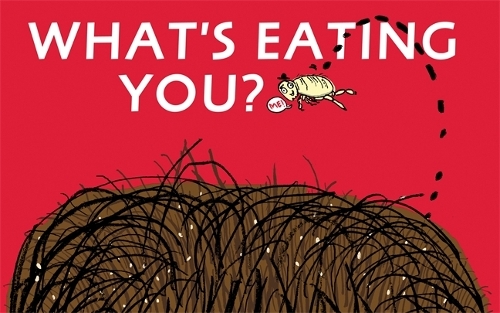 I was especially intrigued to learn about the mole cricket that digs a hole with a shape that acts like a trumpet, making his voice sound 250 times louder and making the ground vibrate some 2,000 feet away. Baby crocodiles make an "Umph, umph, umph" sound while they are still in their eggs. Buried under rotting plants and mud, the sound alerts the mother that her babies are ready to hatch so that she will return to the nest and also as a way of letting their brother and sisters know that it's time to hatch so that no one gets left behind. And did you know that young male chaffinches spend weeks listening to adult males and practicing ("very quietly, with their beaks closed) before singing? Or that dolphin babies "babble" like human babies, keeping useful sounds and dropping others after a few months? 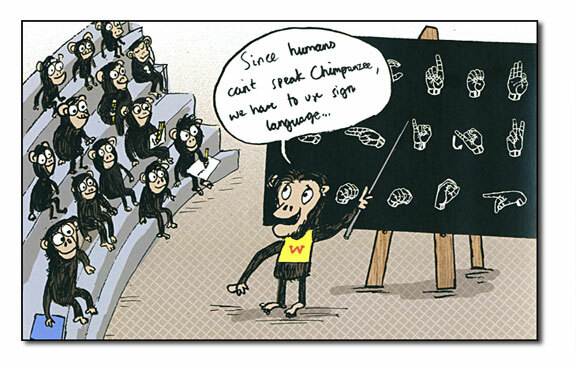 Finally, Davies discusses the ways in which monkeys talk to each other and have the capacity to learn human language, using Washoe the chimp and Alex the parrot as examples. Davies ends her book by noting that scientists have developed computer programs "that can spot the tell-tale footprint of a language in any signal. One day this technique could be used on dolphin sounds, which might be close to our idea of language. Maybe then we'll finally know what animals have to say about us!" Davies is also the author of two new books for the five and under crowd, colorfully illustrated with thick, glossy pages and flaps to lift and the beautiful book of poetry Outside Your Window: A First Book of Nature.